View cart “Hand Painted Set of 2 Ceramic Coffee Mugs. Colored Dot” has been added to your cart. From Spain authentic ceramics, pottery, gourmet food, paella pans and gifts are some of the the high quality items available at fromspain.com. Spain's culture is full of warmth, creativity and vitality and it is a pleasure to share this with you. From Spain's ceramic and Spanish pottery is handmade by local artisans. Each piece is individually hand shaped on a potter's wheel and then hand painted and signed by the artist. Authentic Sangria pitchers, olive dishes, and garden pots are a few of the unique items in the From Spain Ceramic Collection. Choose from an extensive collection of Spanish Talavera ceramics known as ceramica. 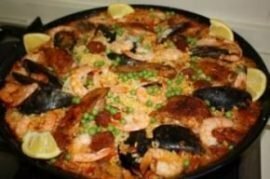 Paella supplies including paella pans, paella rice, smoked paprika, saffron, Spanish olive oil and vinegar, olives and traditional Spanish foods are carefully selected to include the most savory of items. Chorizo, Spanish iberico jamon, honey…. 100% natural, hand prepared and gourmet quality food from Spain. From Spain's Home Décor includes an selection of wrought iron furniture from Guadarte in Sevilla, hand-blown glass from Mallorca and hand-carved olive wood from Navarra. Spanish Executive and corporate gifts from Spain are available. The From Spain gift collection includes sangria pitchers with sangria recipe book, tapas plates with tapas recipe book, olive dishes with gourmet Spanish olives, hand-painted ceramic cookie jars filled with Spanish candy, chip and dip sets and olive oils with dipping bowls. Let From Spain put together a creative Spanish gift idea for your wedding, bridal shower, housewarming and any festive holiday and occasion. From Spain offers a unique gift with a Spanish touch. Custom Bridal and gift registry is also available. From Spain offers the best of Spain here in America!